The main event over the weekend was China's decision to pull out of trade talks with the US amid a broad cooling of relations between Beijing and Washington, coupled with the US decision to launch "Phase II" of the trade war implementing $200BN in new tariffs on Chinese imports. As markets are closed in China, Japan and South Korea, traders expressed their sentiment via the Hang Seng and ASX both of which are down. Looking ahead at this week's main events, we have trade, Wednesday's FOMC meeting, the Italian budget, the UK's next move on Brexit after the Salzburg fiasco, inflation data in the US (PCE) and Europe (CPI),the General Debate of the UN General Assembly and a host of trade related meetings on the sidelines, and a steady stream of central bank speak. The other date to be aware of next week is Thursday which is the deadline for Italy 's draft 2019 budget. As has been the case of late expect daily newsflow in the interim on this. A deficit forecast of 1.6% GDP would be a long way from the fears upsetting markets over the summer. Meanwhile the big data highlights next week are the latest inflation prints in the US and Europe. On Friday we'll get the August PCE report in the US where the consensus expects a +0.1% mom print which would be enough to hold the annual rate at +2.0% yoy. In Europe we'll get the September CPI report for the euro area on Friday too with the consensus expecting no change in the +1.0% yoy core reading. Country level data in Europe is also due out in Germany (Thursday), France (Friday), Italy (Friday) and Spain (Friday). On trade, Tuesday will see the General Debate of the UN General Assembly kick off in New York including an address from President Trump. On the sidelines of this Japan PM Abe will meet with Trump to discuss trade with Trump also confirming bilateral meetings from leaders of South Korea, Egypt, France, Israel and the UK. EU Trade Commissioner Malmstrom is also due to meet US Trade Representative Lighthizer and Japan's Economy Minister Seko in New York to discuss trade. So plenty to watch. As for the remaining data due out next week, in the US we've got various manufacturing surveys due through the week including those from the Dallas Fed (Monday), Richmond Fed (Tuesday), Kansas Fed (Thursday) and Chicago PMI (Friday). Also due out in the US is September consumer confidence on Tuesday, August new home sales on Wednesday, the third and final Q2 GDP print, August advance goods trade balance and preliminary durable and capital goods orders on Thursday, and final September University of Michigan consumer sentiment survey revisions on Friday. In Europe, Germany 's September IFO survey on Monday and September confidence indicators on Wednesday for the euro area are also worth highlighting. It's also a busy week for central bank speakers next week. On Monday ECB President Draghi is due to speak to EU Parliament. On Tuesday BoJ Governor Kuroda will speak following the BoJ's latest meeting minutes release, while the ECB's Coeure and Praet, and BoE's Vlieghe are also due to speak. On Thursday BoE Governor Carney and Chief Economist Haldane speak, along with the ECB's Draghi and Praet, and Fed's Kaplan. Fed Chair Powell is also due to make brief remarks on the US economy at a Senate event. The Fed's Barkin and Williams then speak on Friday along with the BoE's Ramsden and ECB's Lane and Praet. Finally, other snippets worth highlighting include the OPEC meeting in Algiers tomorrow where members are due to review compliance with output targets, and Italy's Salvini taking part in a forum tomorrow. On Monday France is due to unveil its 2019 budget while German Chancellor Merkel takes part in a town hall event. On Wednesday EU27 government envoys meet in Brussels to discuss Brexit while on Thursday Turkey President Erdogan begins a three-day visit to Germany where he is set to meet with Merkel. Monday: It's a quiet start to the week for data on Monday. In Europe, we get the September IFO survey in Germany along with September CBI Trends total orders and selling prices data for the UK. In the US, we'll get the August Chicago Fed national activity index and September Dallas Fed manufacturing activity index. Away from that, ECB President Draghi is due to speak in Brussels. Monday is also the day when the US will start levying 10% tariffs on the additional $200bn of Chinese imports. Away from that, German Chancellor Angela Merkel will speak in Hanover, France will unveil its 2019 budget and French President Emmanuel Macron will meet US President Donald Trump in New York. Tuesday: Overnight on Tuesday we get the minutes of July BoJ monetary policy meeting. In Europe, we get September confidence indicators for France while in the US, we get the July FHFA and S&P CoreLogic house price index, September Richmond Fed manufacturing index and September consumer confidence data. Away from that, the BoJ's Kuroda, ECB's Praet and Coeure, and BoE's Vlieghe will be speaking at different times. Japanese PM Shinzo Abe will meet with US President Trump in New York to discuss trade while EU Trade Commissioner Cecilia Malmstrom will meet with US Trade Representative Robert Lighthizer and Japan’s Economy Minister Hiroshige Seko in New York to discuss WTO reform and trade. President Trump will also address the UN General Assembly. Wednesday: The big highlight on Wednesday is the FOMC meeting and Fed Chair Powell press conference. Data-wise there is nothing of note in Asia while in Europe we'll get September consumer confidence for France and September CBI retailing reported sales in the UK. In the US, August new home sales data is due. Also worth highlighting is the EU27 government envoys meeting in Brussels to discuss Brexit. Thursday: It's a pretty busy day on Thursday with lots of data releases lined up including preliminary September CPI for Germany and the final Q2 GDP print for the US. Prior to that we get August industrial profits for China while in Europe we get preliminary October GfK consumer confidence for Germany, August M3 money supply and September confidence indicators for the Euro area. In the US we'll get the August advance goods trade balance, preliminary August wholesale inventories, August retail inventories, preliminary August durable goods and capital goods orders, latest weekly initial jobless claims, August pending home sales and Kansas City Fed manufacturing activity data. Away from that, the BoJ's Kuroda, BoE's Carney and Haldane, ECB's Draghi and Praet, and Fed's Kaplan will all be speaking at different times during the day, with Fed Chair Powell also scheduled to make brief remarks on the US Economy at a Senate event in the evening. Turkish President Erdogan also begins a three-day visit to Germany, where he’ll meet with Chancellor Angela Merkel. The OECD is also due to deliver a press conference on barriers to trade, while Thursday is also the deadline for the 2019 draft budget in Italy. Friday: It's a busy end to a busy week on Friday with the highlights being September CPI for the Euro area and August PCE data for the US. As well as that, overnight we get September GfK consumer confidence for the UK along with summary of opinions of the September BoJ monetary policy meeting, August retail sales and preliminary August industrial production for Japan, and September Caixin manufacturing PMI for China. In Europe, we get preliminary September CPI for France, Spain and Italy, September unemployment for Germany and final Q2 GDP revisions for the UK. In the US we get August personal income and spending data along with the September Chicago PMI and final September University of Michigan survey data. Finally the Fed's Barkin and Williams, BoE's Ramsden, ECB's Lane and Praet will all be speaking at different times during the day. 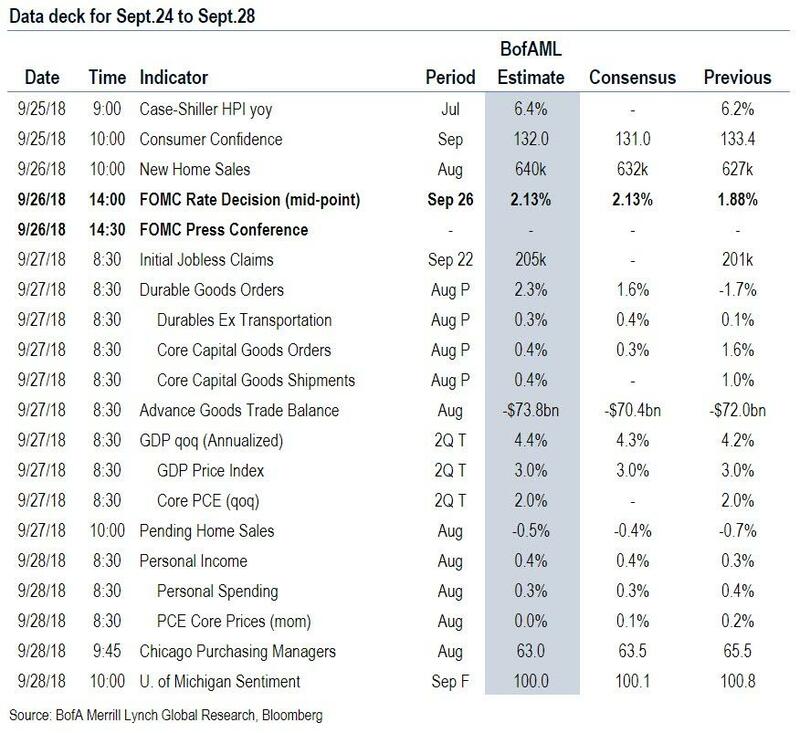 Finally, here is Goldman's preview of just US events, where the key economic data releases this week are the durable goods report on Thursday and core PCE on Friday. In addition, the September FOMC statement will be released on Wednesday at 2:00 PM EDT, followed by Chairman Powell’s press conference at 2:30 PM. 09:00 AM S&P/Case-Shiller 20-city home price index, July (GS +0.1%, consensus flat, last +0.1%): We expect the S&P/Case-Shiller 20-city home price index increased 0.1% in July, following a 0.1% increase in June. Our forecast of a modest increase reflects a slower pace of home price appreciation in other measures such as the FHFA house price index and residual seasonality in the home price index. 10:00 AM Conference Board consumer confidence, September (GS 132.0, consensus 132.0, last 133.4): We estimate that the Conference Board consumer confidence index decreased 1.4pt to 132.0 in September after increasing 5.5pt to 133.4 in August, a new cycle high. 10:00 AM New home sales, August (GS -0.1%, consensus +0.5%, last -1.7%): We estimate new home sales declined by 0.1% in August, following a 1.7% decline in the prior month. Single family starts increased in August, while mortgage applications sharply declined. 02:00 PM FOMC statement, September 25-26 meeting: As discussed in our FOMC preview, we expect the FOMC to raise the target range for the funds rate by 25 basis points in the September meeting. In the post-meeting statement, we think the committee is likely to retain the upbeat tone of recent meetings, with minimal changes to the overall language. In the Summary of Economic Projections (SEP), we look for: (1) slightly higher median estimates for 2018 GDP growth; (2) a slight increase to the median unemployment rate projection for 2018, and unchanged headline and core inflation projections; and (3) a firmer consensus behind the current median policy path of 4 hikes in 2018, 3 hikes in 2019, and 1 hike in 2020. 08:30 AM U.S. Census Bureau Report on Advance Economic Indicators; Advance goods trade balance, August (GS -$71.8bn, consensus -$70.6bn, last -$72.2bn); Wholesale inventories, August preliminary (consensus +0.3%, last +0.6%): We estimate that the goods trade deficit declined slightly in August, as goods exports likely rebounded. We note that outbound container traffic also rebounded in the month while inbound traffic declined somewhat. 08:30 AM GDP (third), Q2 (GS +4.2%, consensus +4.2%, last +4.2%): Personal consumption, Q2 (GS +3.8%, consensus +3.8%, last +3.8%) We do not expect a revision in the third vintage of the Q2 GDP report (previously reported at +4.2% qoq saar). We also forecast an unchanged reading for personal consumption (+3.8% qoq ar). 08:30 AM Durable goods orders, August preliminary (GS +3.3%, consensus +1.9%, last -1.7%); Durable goods orders ex-transportation, August preliminary (GS +1.4%, consensus +0.4%, last +0.1%); Core capital goods orders, August preliminary (GS +0.2%, consensus +0.4%, last +1.6%); Core capital goods shipments, August preliminary (GS +0.4%, consensus +0.5%, last +1.0%): We expect durable goods orders to increase in the August report, given stronger data from commercial aircraft orders and scope for an increase in defense spending. Given strength in manufacturing surveys from earlier in the month, we see scope for further core capital goods orders growth. Manufacturing production growth was below expectations in August, but there was strong growth in the capex-sensitive business equipment category of industrial production. Accordingly, we look for a 0.4% increase in core capital goods shipments. 08:30 AM Initial jobless claims, week ended September 22 (GS 205k, consensus 209k, last 201k); Continuing jobless claims, week ended September 15 (consensus 1,675k, last 1,645k): We estimate initial jobless claims rose 4k to 205k in the week ended September 22, after falling to the lowest level since 1969 in the previous week. While we expect a pickup in filings in the aftermath of Hurricane Florence, we note that claims typically increase in the weeks following the initial week, given closures of claims offices and overall weather-related difficulties in filing claims. 10:00 AM Pending home sales, August (GS -1.5%, consensus -0.2%, last -0.7%): We estimate that pending home sales declined by 1.5% in August, following a 0.7% decrease in the July report, due to weak regional home sales data so far in August. We have found pending home sales to be a useful leading indicator of existing home sales with a one- to two-month lag. 08:30 AM Personal income, August (GS +0.4%, consensus +0.4%, last +0.3%); Personal spending, August (GS +0.4%, consensus +0.3%, last +0.4%); PCE price index, August (GS +0.12%, consensus +0.2%, last +0.12%); Core PCE price index, August (GS +0.04%, consensus +0.1%, last +0.16%); PCE price index (yoy), August (GS +2.18%, consensus +2.2%, last +2.31%); Core PCE price index (yoy), August (GS +1.92%, consensus +2.0%, last +1.98%): Based on details in the PPI and CPI reports, we forecast that the core PCE price index rose 0.04% month-over-month in August, or 1.92% from a year ago. Additionally, we expect that the headline PCE price index increased 0.12% in August, or 2.18% from a year earlier. We expect a 0.4% increase in August personal income and a 0.4% gain in personal spending. 09:45 AM Chicago PMI, September (GS 63.0, consensus 62.0, last 63.6): Regional manufacturing surveys were mixed in September, and we estimate that the Chicago PMI edged down by 0.6pt to 63.0. Further uncertainty about trade policy could potentially weigh on business sentiment in this report. 10:00 AM University of Michigan consumer sentiment, September final (GS 100.5, consensus 100.5, last 100.8); We expect the University of Michigan consumer sentiment index to edge down 0.3pt from the preliminary estimate for September. The report’s measure of 5- to 10-year inflation expectations stood at 2.4% in the preliminary report for September.